Jerusalem mayoral candidate Zeev Elkin rebuffs Listman's demand that he shutter popular Mahane Yehuda night life scene. Jerusalem mayoral candidate MK Ze'ev Elkin said that he would not comply with demands made by Deputy Health Minister and United Torah Judaism head Yaakov Litzman to close Mahane Yehuda's bustling bar scene. "Let's calm down the Jerusalemites. The Mahane Yehuda market will not close," Elkin told Ynet. "It's an important place to spend time in Jerusalem and I do not think anyone can actually shut it down. To this day I have not heard as the Minister of Environmental Protection that there is a special problem with it." "If the residents have any specific complaint, I would love to hear from them," added Elkin. "I emphasize to the residents, this should not be a political issue. It is clear that the Mahane Yehuda market should continue to operate in Jerusalem and in the end, everyone understands this." 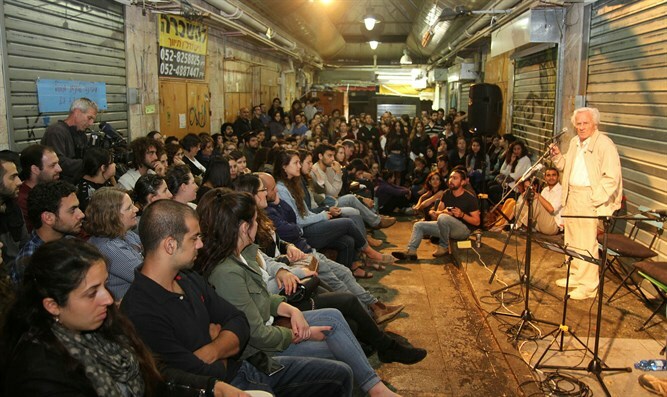 In recent years, the Mahane Yehuda market has become a popular entertainment center for religious, secular and haredi youth. Large beer-laden tables dot the market's narrow alleys after nightfall and the nightlife goes into the early hours of the morning. However, Litzman said that putting an end to what he called the "hotbed of debauchery" is a non-negotiable condition for any mayoral candidate seeking to gain the support of Jerusalem's sizable haredi community. "The Mahane Yehuda Market is a place where drug use goes on every night and there is noise," said Litzman on Sunday. "No one does anything. I complained in the past and no one did anything. I do not know whether I will support Elkin because I have not yet decided who I support." Zeev Elkin, who currently serves as both Minister of Jerusalem Affairs and Environmental Protection Minister, released a statement Thursday afternoon officially announcing his bid to head Israel's capital city. Moshe Lion, a member of the Likud who ran against Barkat in 2013, declared his candidacy earlier this year.